With TVEyes broadcast media monitoring service you can quickly and easily discover TV and radio coverage. Love the ability to go back and review news clips and have the ability to be able to download them and share them with staff internally to promote our earned media success. Some markets aren't available and even some outlets within certain markets. There are also many 24-hour news stations in our promoted region that for whatever reason does not provide metrics like audience and publicity value - which we use to track our efforts' worth. TVEyes has been very helpful in giving us the metrics we need for what our goals are based on. In a role where we are constantly seeking out earned media opportunities, TVEyes takes out most of the guesswork. Part of our goal for public relations is based on media impressions and publicity value, so TV EYes is a convenient way to track those placements and see what their worth was. "Easy way to track your TV mentions"
TV Eyes allows me to keep track of brief mentions our University gets on local television, which are things I'd otherwise not have any access to; this is critical for knowing when media picks up and uses our written outreach. It also tracks and finds clips from other parts of the country, which has led to some nice finds and mentions we'd otherwise never know about. My only complaint would that they occasionally do not track a certain outlet that I need. However, they will take requests and add outlets if they are able. It's a very price friendly product that does an awful lot for you. Highly recommended. The biggest thing is getting a better handle on the reach we get with media releases. We otherwise would have to record and watch or listen to every single news broadcast in the region every single day. Getting a handle on what's getting picked up helps us shape how we do outreach in the future. What Media Monitoring solution do you use? "Easy to use, great insights"
I like the ease of use and the downloading capabilities. Compared to one-off clip services, TVEyes is so much more valuable. I like that estimated value of the clip and estimated viewership is included along with the transcript. Being able to save items in to the library is super useful as well. I'd love to be able to create a branded newsletter - not just a report - with selected clips highlighted and linked. If you constantly use clip services at a one-off rate, definitely write TVEyes into your budget. It will give you a lot of information, and offer you an opportunity to do competitor research or even best practices of other similar companies. It assists greatly (especially in the nonprofit arena) of clearly articulating the value of a communications and marketing department. TVEyes provides a great way for me to track our hospital's exposure on our local TV stations. I also like that I can save specific clips and send them to our doctors or nurses who have appeared on local media, especially those who are not comfortable or very well versed in public speaking. It allows them to evaluate their performance and improve. I dislike that oftentimes the clips that are being saved are not stories - they are advertisements or other features. I don't really blame TVEyes for this because we sponsor several weather cameras around the area, and so our name is brought up on TV every day. But it does mean I have to wade through all of the weather mentions to get to actual coverage. It helps me keep track of stories we are doing, which doctors and nurses have gotten media coverage, and even, on rare occasions, it's alerted me to a story that's going on about our organization that I wasn't aware of. This allows me to flag management and help prepare a response, if it's something potentially negative. TV Eyes also provides real-time audience insights and earned media value, giving us the ability to provide ROI to clients as well. Having a real-time monitoring and alerting tool has allowed us to be proactive in a number of ways: watching secured segments live, responding to comments immediately or monitoring for brand mentions in a crisis situation. One VERY important distinction between TV Eyes and its competitors is that TV Eyes monitors and picks up EVERYTIME a segment about your company/client runs. Local TV will often run the same segment multiple times, which makes a big difference in terms of reach and impact, and TV Eyes will report to you everytime the segment runs: 5 am, 7 am, 6 pm newcasts, etc. Competitors will only catch a segment once, which is not truly reflective of the media coverage you're getting. Additionally, the customer support is very fast and responsive and the price is reasonable. Not necessarily a disklike, since all broadcast monitoring tools do this, but something to keep in mind is that the monitoring is all based off of closed captioning keyword searches and closed captioning may write the same word multiple ways. This means it is really important to think about all the different ways a word/name may be captured on closed captioning and monitor for them all. For example, if I wanted to capture barbecue I would search terms such as "barcecue" and "bbq" and "bar be cue." Proactive media relations as well as brand monitoring and crisis mitigation. "Monitoring News for Law Enforcemet"
Being able to instantly access stories. You don't have to wait a day or two for the system to catch up. I can find what I'm looking for within a few minutes of it airing on TV. Content from Fox News is not available. The keyword search isn't very accurate when trying to track down a specific story. If you don't have a word hit, you must scan through the power search feature to find what you are looking for. This is a great way to gain control over viewing and saving stories, not just in your local area, but nationwide. No longer do you have to rely on contacting news stations or companies for files, which may cost you money. If we miss a story, we can pull it up without searching news outlet websites. We can download and share the files with people in the department, whether it be for their personal enjoyment or to help support an investigation. "Helpful service unlike any other"
TVeyes has an incredible level of detail, almost a complete selection of networks to choose from and find relevant content. The fact that it's up to date almost instantly is also perfect for today's social media environment. Commentary and analysis need to be almost instant to ride the news wave, and TVeyes helps us do just that. Sometimes it's hard to find exactly the clip you are looking for, because if your search doesn't match exactly what is present in the closed captioning, it resets your entire search. makes the search process very long and painstaking. I also wish there was a better way to set up tracking over time, to generate graphs for how often certain words are used by certain networks. We're a non profit that monitors the news and entertainment media in regards to their coverage of immigration. So a tool like this is incredibly helpful to get a detailed perspective from a variety of sources. TVeyes truly provides us with a depth and breadth advantage, no other company compares. "Great way to save time and energy"
I'm instantly alerted when our search terms hit the airwaves and can have a custom link edited ready to share with leadership or download and save within 3-5 minutes of the mention airing. It is a little cumbersome to create reports that are visually interesting and easy to present. The data that can be pulled is good, but it takes a little work on the back end to make it appropriate to share to leadership or board members in a way that would be easily understood by non-media types. We previously tried to record all newscasts on a DVR for monitoring purposes, but that took active monitoring and could easily be thrown off if program changes affected newscast start times or lengths. We also did not have an easy way to share the content that we recorded with other people involved other than having them come to my office and view it or me giving them a summary. "Great tools, easy to use platform"
I like how easy it is to find content when you've seen it on TV. Often times I'll see something when watching TV and be able to download that clip to show co-workers about 4 minutes later. Sometimes the keyword search can be finicky. I've oftentimes searched for a certain word or name, and it doesn't come up with a search, but then used the time search function and found the clip, which included the exact words I searched for in the transcript. I also wish you could set a search term that has multiple spellings, as a lot of times names get misspelled in closed captioning. There are certain topics we're looking to see how the media is covering it. For example, this election season, our organization was really focused on Health Care as an election topic. It was useful to use TVeyes to find out who was talking about Health Care on which network and how they were positioning it. "TV Eyes for Victoria Theatre Association"
TVEyes catches my brand and venue mentions very well. We are mentioned quite a bit because our venue hosts many organizations, so it is good to know when the name is mentioned. I especially like the value of the mention info. Great for my board members! I also enjoy the training webinars that are offered. I was thrilled when my rep, Jamie, was able to offer a discounted rate to use TVEyes,. His offer could not have come at a more perfect time! I am still learning the reports and such and adding search terms confused me a bit at first. My problem is that I don't use it as much as I should so I forget how to do things. Because I am human, TVEyes is able to catch mentions of my organizations on broadcast and give me a dollar value each time! PR is difficult to quantify and I have often struggled to provide a dollar figure to a TV appearance,, story or mention. With TVEyes, all I have to do is run a report and it will tell me the market value. ROI on PR is the most important. I am able to tell my supervisor, donors, sponsors, etc. a dollar value of their PR. Was unable to do so before TVEyes. As a non-profit, it is imperative to provide ROI rationale to the board and senior staff. If a program or software does not produce results, then it is cut from the budget. "Very useful but could be more user friendly"
TVEyes has a lot to offer but it does take some time to get used to it and make it helpful to your needs. I would like to see the platform updated a bit to be more user friendly and not seem so archaic. For example, searching TVEyes is located on different pages depending on how you want to do the search. Having every search option on one page would not only be easier but less confusing for folks trying to get the hang of the system. The transcripts could 1000% be more accurate. I know that these are pulled from the station's closed captioning and especially with the local channels these can be pretty rough. But this is the most time consuming part for users to correct if we need to extract them and use them for work. I hate it, my interns hate it, so I really hope there's some work going into fixing this. I work in communications so a lot of our job is tracking relevant mentions in the news, which is often, so as a whole TVEyes is very useful for this and snapstream doesn't even come close to being as useful here. I love how TV Eyes has a lot channels ! It is very user friendly and I can easily manipulate the exact clip that I want to watch and download. I wish TV Eyes had even more channels! Also, I don't like that the website looks like it's from 1990. I think they could use a series upgrade to the software to help with some of the glitchiness. I think its a great resource and super easy - no fuss! If you're looking for a basic system that can accomplish clipping media, this is the right resource for you. Finding earned and paid media placements from media outreach or SMTs that I host with clients. Or, if when watching something on the TV, and we see something that can be useful to our clients, its super helpful to easily be able to go back and watch the clip and send it to multiple people. "Great service at a reasonable price"
I like the ease of clipping video and audio. I also like how well they layout the market watching and the value of the clip. I wish they had full metrics (value and audience) for radio. We get lots of clients there, but can't give them an idea of what the story was worth. This is an easy and cost effective way to gather your television and many radio stories and show value for the hard work that you're doing. I'd recommend it for anyone who is on television or doing public relations because clients love to get a hard copy of their moment on TV. TV Eyes allows us to grab hard copies of our work to use to brag to clients about why they hired us in the first place. We are also able to teach them how to use these assets to promote their business beyond the initial run. 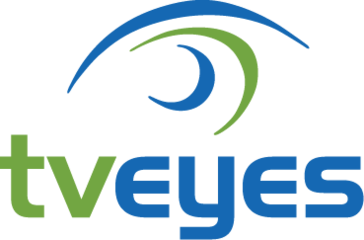 "Easy to use and amazing coverage"
TVEyes offers a user-friendly interface and the depth of coverage is terrific. The monitoring service is superb, and when I need to access additional content, I can find, review and save any clip I want in a matter of minutes. But what I like best is the fact that TVEyes offers outstanding customer service. The reps are always quick to respond and extremely helpful. They understand our needs and are always willing to go above and beyond for us. The format of daily media alerts reports can be overwhelming due to the large number of hit we generate. I'd like to see some summary information added to each alert to help summarize the results with a glance. TVEyes is worth the investment. TVEyes is a great help to our brand and reputation management. Finding, reviewing and sharing relevant content is no longer a problem for our organization. "Useful, but needs an upgrade"
Convenience of use. Ability to track when and how we are mentioned. Not being able to efficiently search through clips that you've saved in your media center. You need to hit NEXT through each page to go back in time, unless you change the URL. I feel like there would be a better way. I also wish there was a way to export hits into an Excel report, choosing the categories you'd like to have in the representative.o I don't believe there is, so we track all of ours manually, which can be very time consuming. Would also be better if the text was less gibberish. You can rarely just look at the text to get a sense of the topic of conversation. Tracking of all of our TV/Radio hits. Sharing clips when necessary. It is beneficial to have as a service as we need to report on our media coverage.
" POWERFULLY SIMPLE TV SEARCH"
Keep organized as you search. Just click and save to Archive to review and share at a later time. Creating reports is powerfully simple. Click, add, annotate and edit. Add analysis and commentary. Share with executives, account teams and clients. See? You’re simply powerful. Our broadcast monitoring suite keeps you on top of TV and radio coverage no matter where it appears – on CNN, on the local NBC affiliate in Twin Falls, Idaho, or broadcast over the radio airwaves in Trinidad. Our powerful tools help you discover and pinpoint the right clips easily, analyze the impact and report successes widely. TVEyes was VERY user friendly. And the customer service was very prompt and thorough. I was able to figure out the product from my very first use and without the tutorial videos that were recommended to me. I have no complaints! I had nothing but ease the very first time I used the product. I didn't even need to watch the tutorial video. I highly recommend TVEyes to anyone looking for an easy method to viewing news about any particular topic. We have used the product to monitor news for our clients. It's a great one-stop-shop for clipping tv blips. "TV Eyes Instrumental to Track Media Coverage"
I like being able to edit and download the video clips so I can share them with my school administrators. Being able to give tangible proof of coverage, including the monetary value of those clips, is a key way to collect data to support job performance. There is really nothing that I would ask TV Eyes to do differently. The alerts that go to email are very helpful and the search functions are easy to use. TVEyes streamlines the process of searching for news coverage about your company, non profit or other entity. It reduces the amount of time spent doing this sometimes tedious job. Being able to show an increase in the ad value each year is a helpful way to indicate our success in story pitches and the value of positive coverage of our district. TVEyes is so comprehensive and easy to use. I check in every day and find it an invaluable resource. I wish you could bring Fox Business and Fox News back. Take the time to familiarize yourself with the product and keywords. Transcripts aren't always entirely accurate, so add adjacent spellings to capture more coverage. TVEyes is instrumental in tracking all of our broadcast coverage. It's really important to see where we're being cited (TVEyes often finds stuff we didn't even know was coming) and to stay on top of competitors and broader industry trends. "Quality and Reliable Media Monitoring"
The reliability and user-friendliness of TV Eyes are the best I have found. Additionally, the alerts the TV Eyes offers are quick to come and cover even the most obscure mentions. Lastly, the coverage offered is fantastic. From many different local channels to national outlets, to print media and radio, everything is covered. My only real "complaint", if you will, with TV Eyes is the inability to find, edit, and download clips from years past. I have found that unless you clip and download within a month or so it is hard to use the media. I utilize the media market and price share numbers frequently. It is a great way to ensure messaging reach and to stay on top of the latest mentions of my principal. No other service has given me the footage I need to track the TV news cycle, where the online coverage increasingly diverges from what's on air. The search function can be incredibly helpful for research. I would recommend this as an essential service for any campaign for Congress, US Senate, or big city mayor. I wish it were easier to access and search. A single-use search function would be very helpful, since it's not the cheapest platform to maintain an account with. Additionally, I wish there were more extra functions and easier integration for web platforms. In the political space, I think it's essential for races at the big city Mayor level and above. I can track appearances from clients and see the relative value of our earned media (and that of our opponents), giving me an idea of how to spend a very limited TV budget. Knowing where you're showing up on the airwaves is invaluable. "tveyes is a quick and accurate source of monitoring stories and people that are important to me. " The good people at tveyes are always available to answer any questions that I might have; they make you feel like they truly value you as a client. I definitely like the computer seminars they offer from time to time keeping me up to speed on new concepts and techniques. My dislikes are hardly worth mentioning; tveyes is always quick to respond to correct any problem. tveyes is a first class operation that is always there when I need them ready to address any questions or concerns. With tveyes I am able to quickly view news stories as they occur, locally, nationally and internationally. As a veteran photojournalist, tveyes allows me to keep up with the progress of my colleagues in the field. Convenient and picks up relevant content to keywords we set. TVEyes sometimes misses local media coverage, for specific examples it doesn't pick up WYDC-TV Big Fox, which is one of the primary news stations in our area. We don't find local viewership numbers reliable. Very convenient for easy access to clips, but not a reliable media tracking device. We use TVEyes to track our earned media, including interviews and coverage we arrange, and to have clips of aired coverage. It works for our needs. "A great tool for media tracking"
I love that you can edit and save clips, email the clips or links to them as well. It's also great to see the information about reach included. I don't see all of our known appearances show up on the service and you can't search past clips after a certain amount of time has passed. It's such an easy way to track your media appearances and mentions. You can share it among your organization and put an ROI on your earned media. It also allows for teaching moments with your spokespeople. We are able to put an ROI on our earned media appearances which ultimately justifies the media outreach work we do and the team members and other assets needed. Limited coverage outside the USA. Seems to be limited to channels that the Dish Network covers rather than TVRO dishes looking at other satellite backhaul footprints. Desperately needs expansion of cover in Middle East and Asia as well as further rollout of cover in Europe. We watermark video content and track detection of usage via Teletrax, which gives us the location, station, date, and time the content was used in a broadcast. With TV Eyes, where they cover the station, we can easily go to the clip using Teletrax's metrics to see exactly what content was used. "TVEyes — The Best Media Monitoring Service I Have Ever Used!" As someone who has used multiple media monitoring platforms in the past, one of the most common frustrations I ran into was capturing television clips. Other platforms, such as Cision, would show that a client had received TV coverage, but accessing the clip could be an incredibly arduous process. TVEyes changed all of that, with a simple user-friendly interface that is both lean and powerful. The best part about TVEyes is the accuracy and precision of the search engine; with just a few simple clicks, I can find nearly any television segment in any market that I am looking for. One thing that potential users of TVEyes should know is that it can be a little intimidating and time-consuming to learn upon initially accessing the platform. If there is one thing that I dislike about the platform, it is that menus are not always easy-to-navigate, and the system of capturing some clips by sending them via email and others to your Media Center can be clunky at times. However, the platform does offer free webinars that are very beneficial and help to alleviate a lot of the difficulty of navigating the service. Don't let the initial difficulty of navigating the platform intimidate you — once you get the hang of it, it makes life much easier when compiling coverage reports! The biggest benefit that our business has realized by using TVEyes is that we are now able to provide our clients with clips of television coverage in almost real-time, with precise audience measurements that are far and beyond those of other media monitoring services. "TVEyes is a reliable media tracker that Nextdoor depends on daily"
TVEyes is a very reliable product, and one that we use daily to capture broadcast mentions of our company. Although it occasionally misses coverage, I would say 95% gets picked up. It's always easy to use the Date & Time search function or power search to find something that wasn't picked up. It is also easy to clip segments and share the links with the team. Overall, it is a great tool for our team that we would recommend to other businesses. TVEyes doesn't pick up everything but as I mentioned before, it is usually pretty easy to find a clip as long as we know when it ran. I do worry that we occasionally miss important stories that we don't know about and TVEyes doesn't pick up. Sometimes clips won't save properly or will cut out at certain points, but I don't know if that is a TVEyes issue. It would also be helpful if TVEyes could pick up more of the international broadcast channels since we are a worldwide brand, but again, I do not know if this had to do with the package we are signed up for or if TVEyes does not support international. It is a great tool for our Comms team to track hits. We'd recommend it to other businesses. TVEyes allows us to track all broadcast mentions in the US. This is crucial for our team. We use these broadcast clips internally and externally to improve brand awareness, growth, and brand affinity. "Great Way to Track Coverage"
The ability to precisely edit clips. It's great for reporting purposes for the executive team and to show return on investment. The Customer Service Team, especially Nina, is fantastic and provides help and quick responses. Always a pleasure to work with them and we look forward to future projects. The dashboard and download process. It's difficult to navigate and the design looks out-of-date. It'd be nice to see the day at the top and then previews/text of the clips at the bottom. Additionally, providing more reporting features would be fantastic. Please make dashboard update and make user friendly--it's very difficult to navigate and seems out of date. It's great to see coverage that doesn't come through traditional media monitoring services. It's beneficial to be able to download clips and send to those featured and management. We also hope to create a highlights reel with the videos we were able to download using TV Eyes. "My ongoing experience in using TVEyes for political work." I like the editing functions, and the ability to preview a clip in TV eyes before you actually save and create that clip. I think it makes it really easy to create clips when you can preview them before making final so you can make sure you get the whole clip in and it isnt too short on either end. The search functions are difficult, and I think could be honed and made a little more inclusive. I don't think that the power search overall is very comprehensive, or that potentially it is TOO comprehensive and limits results. I would absolutely recommend TVEyes to anyone in the political research or media monitoring space. It's a great asset, easy to use, and comprehensive covering all the media outlets you could need. We've realized a lot of benefits when coming at looking at TVEyes to find coverage of candidates and campaigns that we regularly monitor and follow. "Easy search, easy user interface, easy download"
I like how quickly TVeyes searches by day, time, DMA, station, and keyword. It is super easy to use and very quick. You don't necessarily need to have all this information, really you just need one or two to do the search. Editing clips to be exactly what you need and immediate downloads are great. The transcribing is usually decently accurate, making searching keywords pretty easy. Sometimes there are little hiccups, or small but noticeable skips in the clips. If you are searching for the name of a program or person, or something that is easily transcribed incorrectly, it can be difficult to find a clip without knowing the exact time that it ran. But generally not an issue. Also, when you download a clip and they send you an e-mail, you have to then click on a link in the e-mail and download it again. Not sure why the extra step rather than just send the download directly to your inbox. Go for it! Clips are under copyright though so cannot be re-purposed. We search for coverage of our clients in broadcast news, share clips with them to provide feedback, and use it to scan the news for key words that relate to our clients' industries and understand how the media landscape is talking about their industry. "My TV Eyes Experience has been great!" What I love most about TV Eyes is that it is very simple to use compared to some other platforms I've tried in the past. It also catches broadcast clips instantly from a diverse market. The one-time payment was affordable and accommodated my slim budget. Saving and downloading clips has been a breeze! Being from a very rural area, there have been a few instances where the TV Eyes didn't pick up a mention, but those instances haven't been excessive. As a communications and marketing professional, TVEyes is a great help in demonstrating the effectiveness of my strategies. It's also a great value too! TV Eyes have helped me to track our school's mentions and to see what press releases and stories have been picked up. That' s been a great tool when demonstrating the effectiveness of my department. It's also been helpful in allowing me to share video clips with colleagues and students. Power search and date/time search is great -- it almost always works as expected and is extremely useful in finding what I need to find. It is really, really inconvenient that TV Eyes can no longer pull clips from Fox News. I know that's not entirely in your control, but I'm willing to bet that most of your customers used to rely on TV Eyes to pull Fox News clips. If there's any way you could get Fox News back into the system, I know it would be very appreciated. In politics, being able to clip things from all three cable networks is pretty much a necessity. If you need to quickly get Fox News clips, I would look at other programs. TV Eyes allows my organization to quickly find when we or any of our staff members have been mentioned on television. The ability to quickly clip and share internally, with the general public, or with donors is a great value add to our organization. "TV Eyes can be an eagle eye"
I LOVE when I receive an email that TV Eyes has captured a clip. Editing on TV Eyes is simple and easy. Searching for clips and sending to clients or donors of ours is terrfic PR. We post and share news clips which helps us in our social media prescence. Being able to track the value of our news coverage is a valuable tool when I present results to our Board of Trustees. This feature is AWESOME~! When TV Eyes doesn't work, it is EXTREMELY frustrating!! We have lost so many clips and then my board reports did not show the right amount of coverage. Actualy I rated a 3 in whether I would recommend to a friend as TV Eyes has been very spotty in capturing our news coverage. In fact, we are seriously considering other vendors. The major benefit of TV Eyes, when it is working, is the ability to capture news clips and share with our targeted audiences. A second major benefit is the dollar value of the coverage we receive. Our Board of Trustees are always impressed with the amount of coverage we receive. The ease of editing and downloading clips. This process is so easy and quick! This may not necessarily be an issue with TV Eyes as it is with the networks that provide the content but the fact that you are only able to download in small minute increments makes pulling longer interviews a bear to pull together. It would also be nice if the segment could begin with the show's intro. It would also be nice if there was an option to edit out or stop and continue a recording to cut commercials because this would help with the limited time allowed for the clippings. As an organization who monitors coverage on a regular basis, it is nice to have a system such as TV Eyes that allows me the the ease of pulling segments that have aired but that also provides the segment details such as viewership and per second ad rates. This is invaluable. "Always a valuable tool for clients"
The ease of operation downloading the clips as well as being able to create reports that show the advertising value our PR efforts get for our clients. TV Eyes also allows us to show a more national scope for our clients, especially national. Helps us when we are selling sponsorships for our National buffalo Wing Festival. We also get a pulse on how the media feels about the festival and what their perspective is. "Me encantan la recomiendo mucho"
Muchas veces veo algo cuando veo televisión y puedo descargar ese clip para mostrar a los compañeros de trabajo unos 4 minutos más tarde, me gusta especialmente el valor de la información mencionada. Es muy fácil de usar y puedo manipular fácilmente el clip exacto que quiero ver y descargar. Nos permite realizar un seguimiento preciso del recorte de noticias así como obtener actualizaciones de última hora cuando se menciona al cliente en vivo. "TVEyes is excellent at what it does, and is infinitely useful for tracking the day to day news cycle"
My favorite part of TVEyes is the access it provides to local cable and radio stations across America. It provides an insight into every states' news cycle and issues which dominate airwaves in those states. I wish TVEyes I had the ability to search for TV from months and years back. That being said, TVEyes has a month-long limit for searching which is almost always more than enough. One of the major issues we solve is tracking different events happening hundreds of miles away. With no other way to discover events we care about, TVEyes has become an invaluable tool because of its local television capacity. That I have the ability to own all the clips. The customer service is also great and always available to help. Sometimes the quality isn't the best, even in high def. Also sometimes I can't find the segment and have to know exactly what I am looking for. If you need a downloadable file of a TV appearance this is a great resource. It is easy to search, edit and clip. I wish that the search was a little better. but most are rely on close captioning, so I don't think much better. I am able to download clips and use them in my own business. "TVeyes is a real asset"
I wish local radio were included as well as traditional papers, something comprehensive would be great. I also wish clips lasted longer on the server so I could go back and find older stuff. I’ve used TVEyes to monitor and evaluate our communications and press work. It has helped me articulate the value of press coverage and raise funding to support advocacy work. "An awesome TV news clipping platform!" The best feature of TVEyes has to be the live alerts. You put your keywords into the system, and you're notified within minutes of airtime if those keywords were mentioned. We work with a lot of issues-focused clients, so this is extremely valuable to us. The interface can take some time to learn, and it looks a little dated, but the benefits of the platform FAR outweigh these items. Public relations is a huge component of our business and interactions with clients. TVEyes allows us to accurately keep track of news clipping and mentions, as well as get breaking updates when client are mentioned live. TVeyes is your eyes and ears for television and radio outlets locally and across the country. While the technology is not perfect and may not catch everything, it does a great job of allowing you to track in real-time your earned-media hits, create clips for playback, and more. The technology does not catch absolutely everything and is clumsy on mobile devices. The interface could use an upgrade. Look at other services to see if they have better interfaces while offering same services. TVeyes, for the price, does a great job. Our staff are able to track the results of their earned media efforts and see exactly when and on what stations stories are hitting. You're alerted in real-time to mentions you aren't aware of, and able to track in a timely manner what would otherwise require hours each day of fastforwarding through DVR footage. TVEyes is the best broadcast search engine I've used. Not only do I have quick access to my client's tv and radio coverage, but the system is a breeze to use. The service team is fast to respond and always helpful. While I understand that files are only available for 30 days, there have been times when I forgot this and needed to access something. I just wish there was a cloud that was connected with my account that would send me emails to say that a file was expiring. being able to provide clients with otherwise hard to access broadcast files. TV Eyes finds every mention on broadcast with ease. The search terms are easy to input and also love using the date/time tool to find coverage on the off chance TV Eyes' alert missed something. It's a great and useful tool for any PR or marketing professional. For the price and ease of use it's a winner! TV Eyes allows our PR department to share the broadcast press hits we get with the rest of our team. It also allows us to monitor what is being said / shown about our network. "TVEyes shows you client broadcast coverage that isn't published online "
I love the fact that TVEyes gives me access to all my clients' broadcast clips and media mentions, especially since they aren't published online anywhere. After a news conference, I can see exactly who aired stories about my client, the number of times the story aired, the viewership for each mention, and the total publicity value of the coverage. Sometimes it's hard to find your client's media mentions because their auto-transcription text often misspells things. If your clients acquire a decent amount of broadcast (radio and/or TV) coverage, this is definitely the way to go as far as monitoring and quantifying those media mentions. TVEyes helps prove the value of media coverage to clients by quantifying the publicity value of each clip into an actual monetary amount. "Reports Straight to My Inbox"
With so many media sources, every bit shortcut is a lifesaver. TV Eyes puts custom reports in my inbox. It really is a great product and I am glad we signed on with the company years ago. No complaints! I enjoy the platform and when I have needed support, I have gotten it! Learning how to operate the searches was helpful. This is a great service and a great value. When we have an item go viral online and on broadcast media nationwide, this was great to see where the item appeared. It automates the process of pulling the reports. It is easy to use once you are trained. Customer service is always attentive. There are times when I see something on TV that doesn't end up getting logged. And there have been issues recording mentions through Spanish speaking channels. I wouldn't say it's solving problems. Just gives a good gauge of how our organization is mentioned throughout the local media. "Great service with some kinks"
It's helpful that within seconds of a watch word being mentioned on TV or Radio I am alerted. There have been some problems with the HD download and often time the video recording will "jump" and miss a second or two of what is being said. Ensure the markets that you want to monitor are covered. TV eyes offers by far the widest coverage, however there are still some markets or stations not covered. If you are trying to monitor a smaller market double check that it is actually covered before you sign up. I am able to better track the coverage that we are getting and when there is a topic of interest that is covered by the news I am able to quickly find the coverage and send it to the interested parties. "Service for TV clip is easy and reliable"
TVEyes reporting is easy to understand and allows for customizable searches and automated alerts. The backend is quite easy to use for members of our multi-client PR team. Although we certainly understand why, it is difficult sometimes not having full access to radio stations or some cable tv stations (Fox News, etc.). Make sure you save your clips downloaded as MP4 or MP3 files. Showing the ROI to our clients of public relations activity and the power of earned media. The viewership numbers and media valuation figures are a critical component of our regular reporting to clients. "We Can See It All"
Solid review of sentiment across the country. Sometimes hits are not always accurate, for instance Fairmont State University will come up in our reports. Get it, you won't regret it! I believe the benefits of knowing what is being said about our institution from local to national outlets is a critical and necessary benefit for branding and overall reputation. * We monitor all TVEyes reviews to prevent fraudulent reviews and keep review quality high. We do not post reviews by company employees or direct competitors. Validated reviews require the user to submit a screenshot of the product containing their user ID, in order to verify a user is an actual user of the product. Hi there! Are you looking to implement a solution like TVEyes?